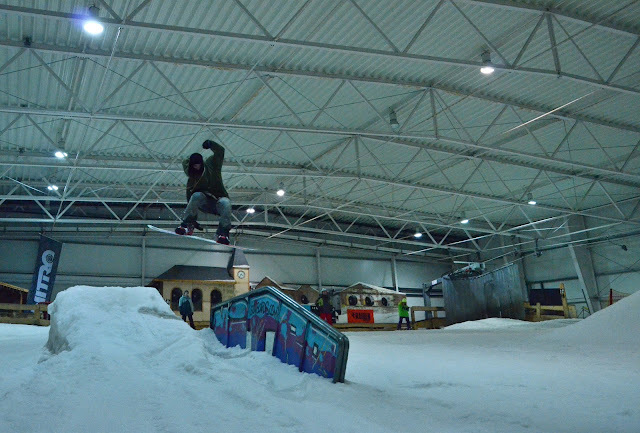 In my blog from Street Arena, I mentioned couple of possibilities of riding, while there is no real snow on the moutains. But there is one more way - visiting indoor ski hall. Me, Steven, Richie and Laci had visited Snowtropolis for one day ni November 2012. 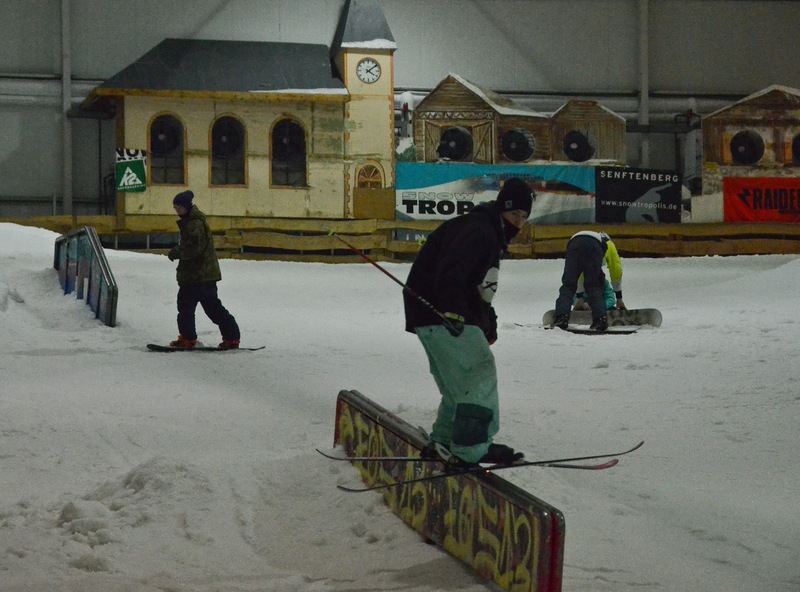 It is indoor skihall in Germany, approximately 2,5 hours away from Prague. One wide slope with a lift and conveyor belt included few obstacles. One line began with street rail, broken in the middle, ordinary straight street rail and a street iron tube. On the other side was head of snow followed by rainbow and wider funbox. We bought tickets for entire day for 30 Euros, changed our clothes and started to ride. 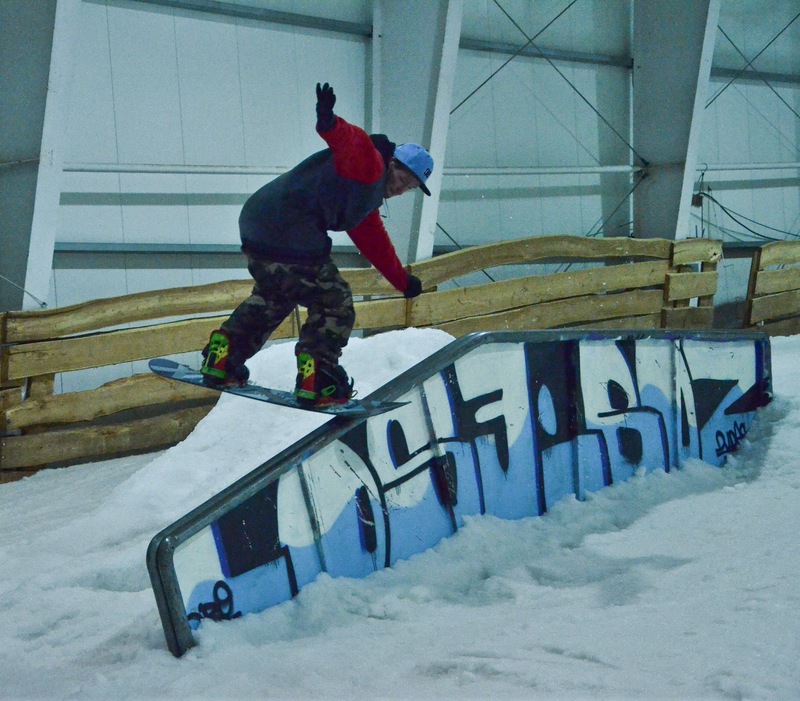 The snow was good, the park was not shaped so well but it was good enough for trying some basic tricks. We all felt that we need some time to get used to it. The lift was slow and after lunchtime the conveyor belt was not working, so people had to wait couple of minutes in a queue. 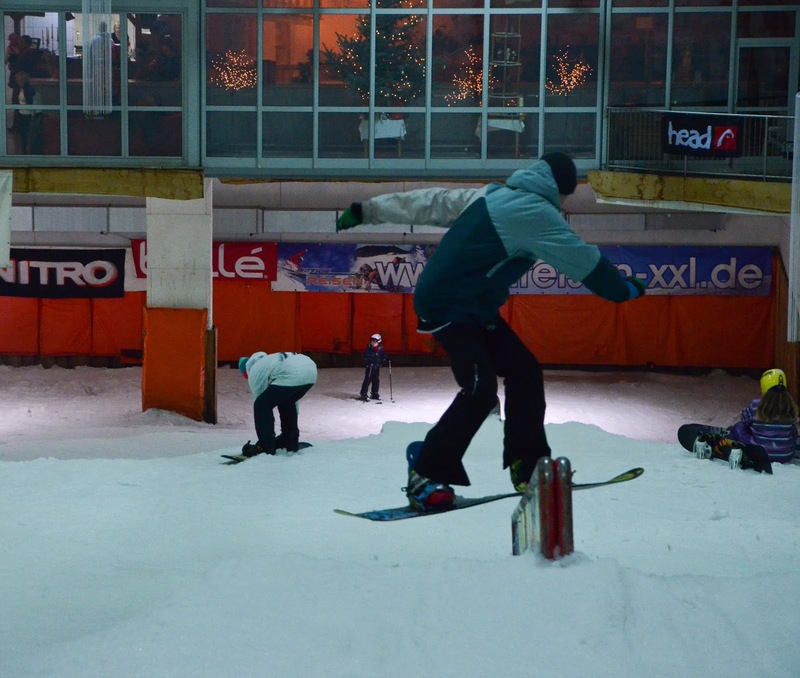 Some locals and other snowboarders were riding later too. Richie and Laci were trying some transfers, Steven some fs noseslide pretzel 45 out and so on. 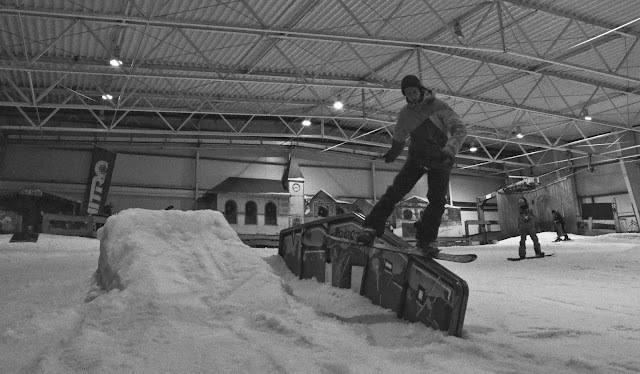 After Street Arena, this was the second time I had my skis on. Finally some reall skiing! 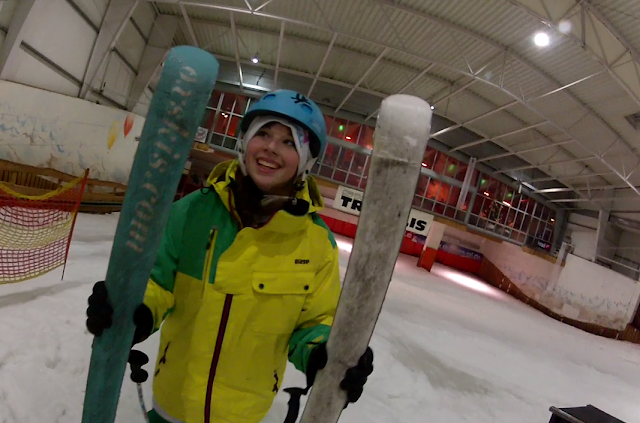 I enjoyed it a lot although it was artificial snow :). 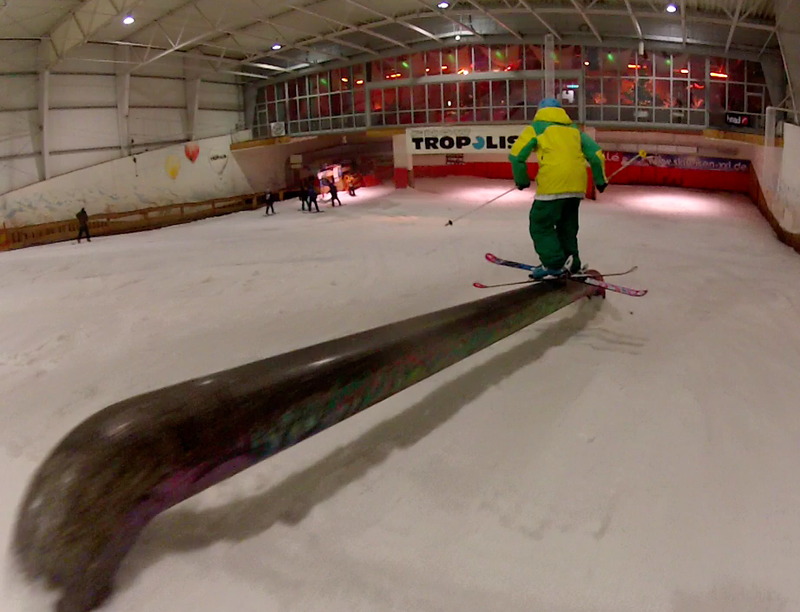 I slided down the rails and also tried some 270s out. Because the snow melted since the lunch time and started to be slushy, later that day I was riding only the box and tried to learn sw 27in. Even the riding was good and pretty much fun, I must admit riding on a real moutains is better for me :).